Looks like a small cucumber, but is actually a squash—this week we’re all about zucchini. Zucchini is an inherent part of the Mediterranean kitchen and aside from antipasti it has become more than trendy. Whether spun into zoodles (aka zucchini noodles), used as low-carb lasagna noodles, or being baked into brownies and cakes–the zucchini is living its best life, and there are plenty of good reasons for it. Next to its mild taste, low price, and incredible versatility, it’s low in calories and packed with potassium, and vitamins c and b-6. As we already mentioned, the zucchini is part of the gourd family which also includes pumpkins, watermelons, and even cucumbers. More closely related to pumpkins, it wouldn’t seem so at first glance because of their long, slender shape and green skin, but the name “zucchini” actually comes from the Italian word for pumpkin or squash, “zucca.” The mild yet lightly sweet, both fruity and vegetal flavor is the reason for its wide variety of culinary uses all over the globe. 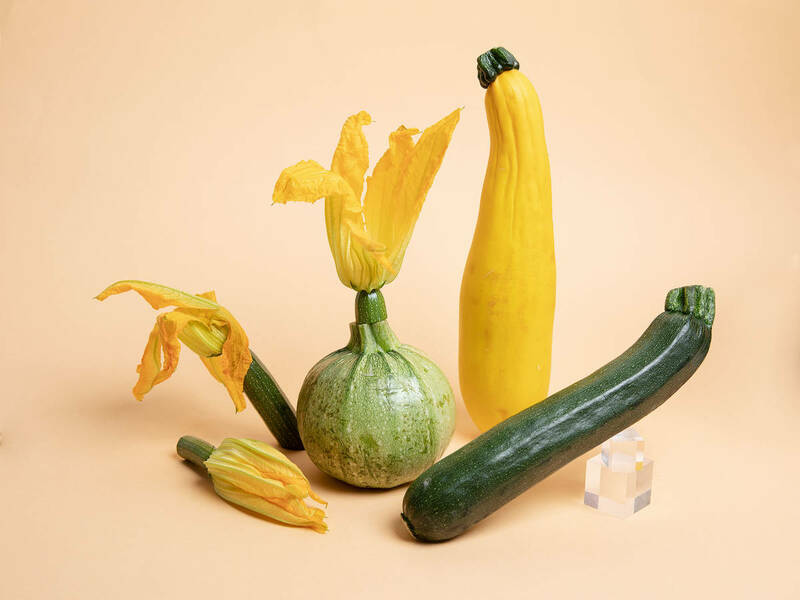 The most popular type is the green or yellow zucchini that is about 20 cm (8 in) long and a subtly speckled or striped peel. More recently farmers are growing round zucchinis, which you can find at many farmers markets. The zucchini is a typical summer vegetable and in season from July to October. You’ll find them in the vegetable department of your supermarket or at a local farmers market. A fresh zucchini has a firm, shiny peel without any wrinkles or soft spots. Raw or cooked it should taste neutral to slightly sweet. Buy them individually when you can–normally these are fresher and less prone to damage than the pre-packaged ones. Compared to other squashes, which are sturdy and durable for months, the zucchini should not be stored for too long. Keep them in a cold, dark place like the vegetable compartment of your fridge or your basement, where they remain fresh for up to one week. To avoid marks and mold, store them side by side and never next to tomatoes, bananas, or apples, as they release ethylene, a natural gas that will make zucchini go soft more quickly. Wrapped in paper towels or parchment paper they will remain fresh even longer. The preparation of a zucchini couldn’t be easier. Simply wash them and cut off the stem, that’s it. Now you can start to prepare it as desired. Depending on the recipe, grate it or cut it into strips or rounds, or even hollow it out and stuff it. It’s always better to leave it unpeeled, not just because the peel contains a lot of nutrients, but also because it prevents the zucchini from overcooking and turning into mush. Depending on the dish, you can fry zucchini in a pan, blanch it in salted water, roast it on a grill, steam it, or bake it.